Our state of the art salon based on Springfield Terrace, Dunblane, is the only place to go for dog grooming in Stirling, it﻿ has been lovingly designed to provide the ultimate retreat for your precious companion. We have created a safe haven where your dog can be groomed, pampered and indulged. Our salon offers Stirling's most exclusive selection of bespoke dog grooming services along with luxury spa packages to ensure your furry friend looks it's best! "Amazing young woman. Highly recommend Sarah. She has groomed both our Alaskan malamutes for show and our westie and border terriers. No hesitation in recommending her, if you are looking for a first class dog groomer in Stirling Sarah is your girl". 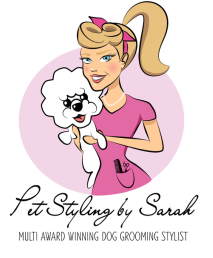 "This girl goes that extra mile, really cares about her customers and the dogs in her care. Always very welcoming and happy to help us - even if we walk in with a very muddy, wet Archie! " "Sarah has groomed my lhasa apso since she was a puppy, we have always been delighted with every trim. I feel really relaxed leaving her with Sarah because when I come back she wants to stay with her! Sarah has a lovely way with the dogs and is a true perfectionist"
"Amazing groomer! Great at putting both owners and animals at ease! My dog is ready at the agreed time, and is always relaxed and happy when I collect her. I'd recommend her to anyone looking for a groomer who understands what owner's want! If you are looking for dog grooming in Stirling then give Sarah a call". "Sarah is very talented and amazing with the dogs. All my dogs are more than happy for her to groom them and are very relaxed around her. I couldn't ask for anything more"
"Sarah absolutely adores animals and loves styling/grooming. Very skilled and experienced with a huge heart and understanding for pets. If you are looking for dog grooming in Stirling then I would highly recommend her". "Brilliant groomer, I wouldn't take Casper anywhere else. Best dog groomer in Stirling"
"Brilliant groomer, it took me a while to find the right dog groomer in Stirling however, I couldn't go anywhere else now. Sarah is always great with pets and buster just loves when he goes to see her!"